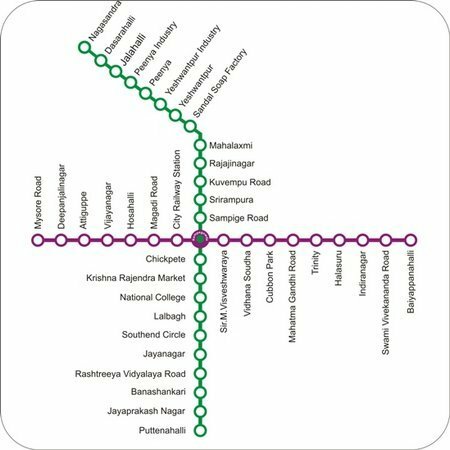 The Bangalore Metro (BMRCL) has today stated that the metro services towards West and South Bangalore must see the light of the day by about the third quarter of the next year. While this is an unexpected delay, it will no doubt be a boon when this really opens up to this extent. 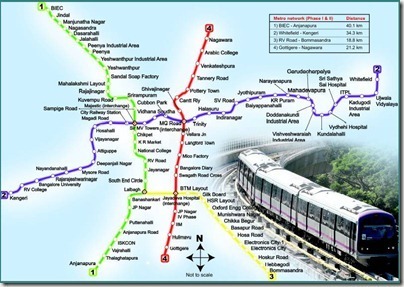 The most crucial parts of underground metro lines surrounding majestic (city central) area would however not be ready until almost mid of 2014 which is when one can say the two lines are completed and fully usable. On the south stretch, KR Market to Puttenahalli (near Metro Store on Kanakapura road) and on the west stretch Swastik to Hesaraghatta (which is more of a straightforward line) would be a substantial distance of coverage for some real time commutes for the people residing there when it opens up for public. Particularly its bad luck for the people around Vijayanagar as they have to wait atleast another two years before their route sees the light of the day! For now its a long wait of atleast one more year until the said plan takes shape and we see some routes operational. Better late than never! Also the government has approved a direct line between MG Road and BIAL (airport) which is expected to take people to the airport in 44 minutes from MG road. The only downside of such a decision is the amount of road work, dust and pollution it is expected to create for the next two years along the already screwed up Bellary Road. The government has also considered a route between Banashankari Temple and Electronics city along the outer ring road and Hosur Road, and another line between IIMB and Nagawara junction to facilitate people from the south to reach the north easily. These are just on paper as of now and hopefully must be part of atleast a 2020 vision for Bangalore. This is acceptable considering that the busy London Underground Tube Rail took almost a 100 years to reach where it is today! Good luck to you BMRCL and hope you cheer up many more people next year by finishing things on time!